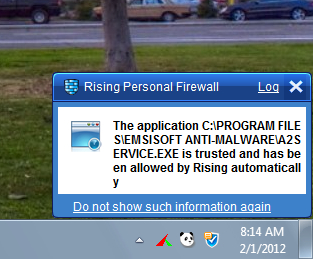 Rising Firewall: Always fails in Shields Up! Discussion in 'other firewalls' started by sg09, Jan 30, 2012. I have heard good words about Rising Firewall. But whenever I try it against Shields Up! 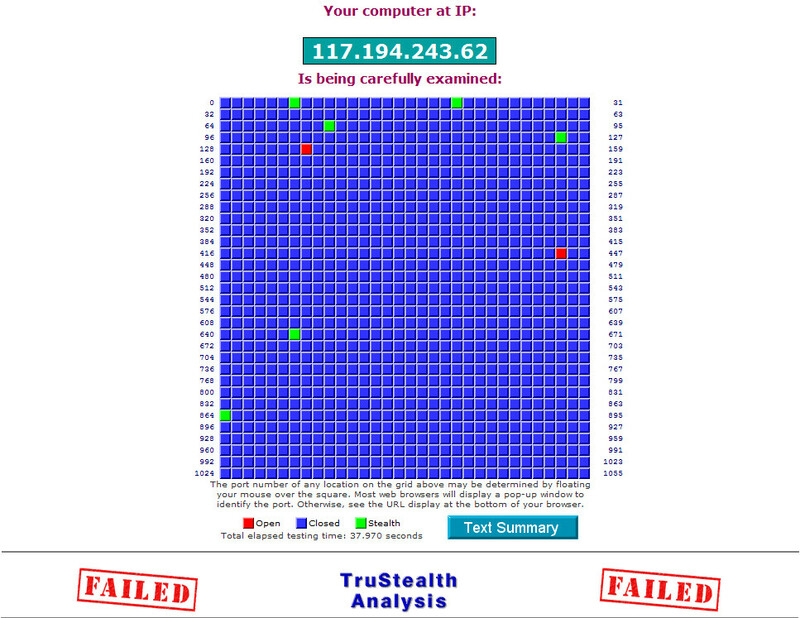 test it fails. 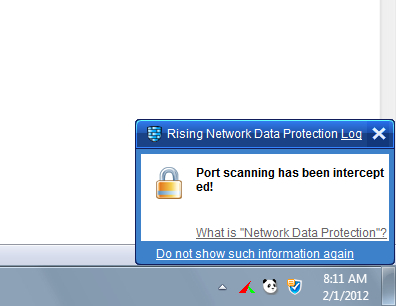 I got the pop-up "port Scanning intercepted" multiple times and after all port scan I find a few opened, some stealth and most closed. I have installed Rising just today and before installing I checked that Windows Firewall Stealth all ports in Shields Up! Whats your point? If your on a secure network in your own house who cares what Shields Up says. This is another one of those things that makes everyone think they need this and that just to stay safe. The firewall in its default state leaves several ports open. At the very least the firewall should close all ports. If you have unexpected open ports, maybe you should try configuring the service or application using them first. Ports aren't open by themselves. I agree with what you are saying but, I had the same problem with this firewall (port 1025 open)...I changed to Privatefirewall and its closed, no configuration needed....It should ideally work out of the box...no? This means that no applications were using those ports. Only after installing RFW this happened. I had experienced that before too and also confirmed by wat0114. Some ports which were opened yesterday are closed today (902 and 912). Does that mean RFW has kind of adaptive behavior? Personal firewalls are beginning to exhibit "adaptive behavior". The grid shown to the left starts off showing ports mostly closed with a few open (mostly blue with a few red cells). Then at some point it suddenly switches into "stealth mode". This can occur when a firewall "adapts" to the scanning IP and raises its defenses against just the attacker. This complicates the job of accurately checking a system's security. Two things you can do: If you are not certain whether your firewall is adaptive, you can re-run any test here to compare the results. Differing behavior often indicates that your firewall has "learned" that it is being probed from our IP and is treating it differently. For the most accurate scan results, disable any adaptive behavior during the testing. How check if RFW has some adaptive nature? And how to disable that? 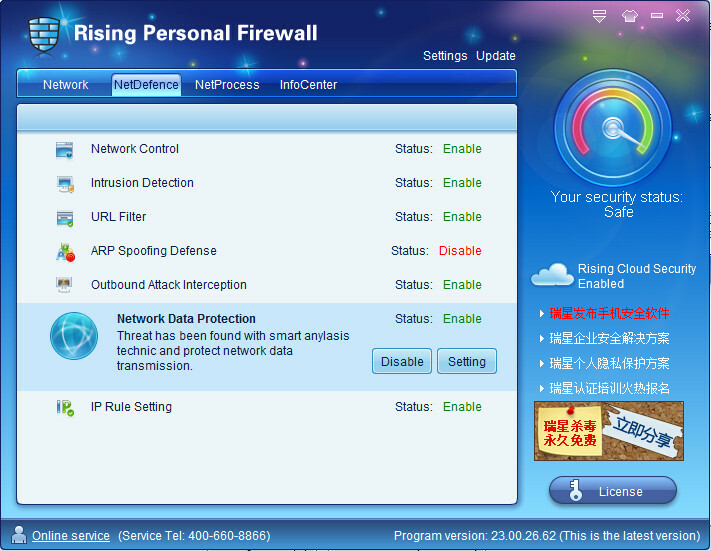 Settings->Net Defence->IP Rule setting->Deny 135 and 445. It didn't seem to make a difference for me. 2. It does not alert to applications (Firefox for example) attempting network access. 3. Unless I missed it, there is no logging built in whatsoever! 4. even though it's not necessarily important, it does not seem to stealth all ports. It appears to close some, leave one or more open, and stealth all the others. All of this I find, imo, unacceptable. 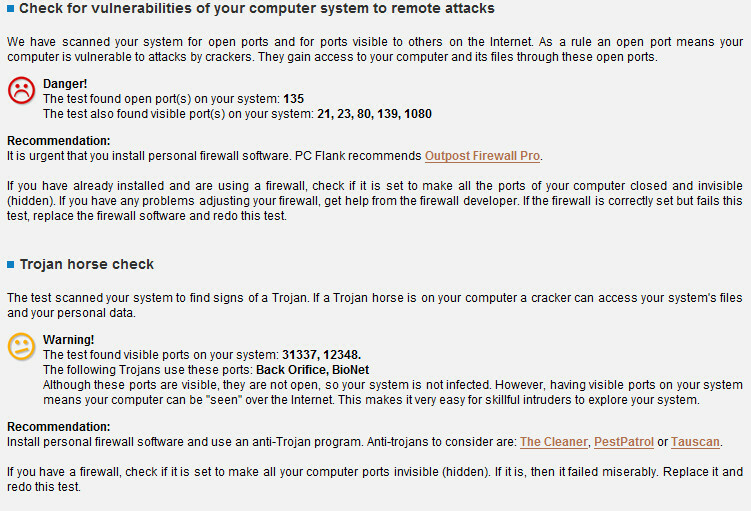 I would never recommend this firewall/security suite to anyone. What I am really concerned is that it lefts ports open but there could be an adaptive behavior and it fails against PC Flank test. 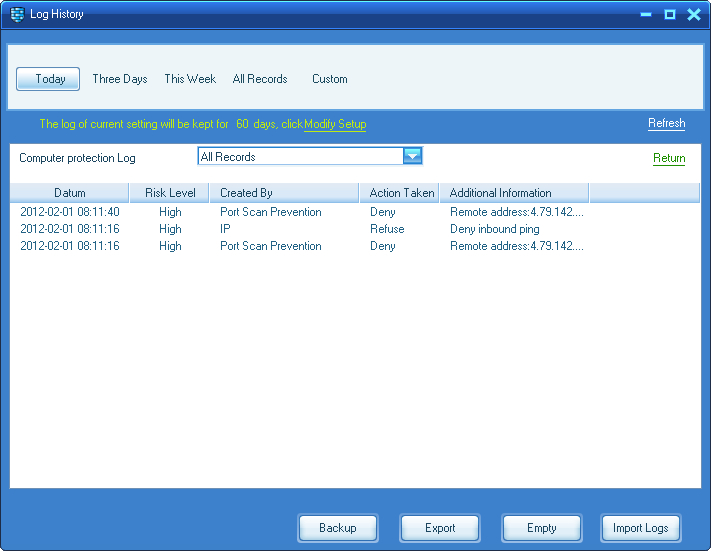 The alert now works after I put the "Outbound attack interception" levels to "High". Strange, however, that scan results are all over the map. Sometimes certain ports are open and sometimes they're not. I ran two more and the first showed 139 & 445 open, but a second time they were closed?? That's what I found too. Adaptive nature..? Did you test the 2012 beta version to see if any port anomaly is present? the 2012 beta might be better then 2011. Try it and let us know. I usually refrain myself from trying out beta products in my real machine. I might give it a try in virtual machine.